The young minds we read to at home are at the brink of or in the midst of discovering and traversing the fascinating world of mathematics and science. For some of our little ones, the enormity of it can seem too abstract to comprehend. It helps to step away from the numbers and into the lives of people - real and concrete, lives of mathematicians and scientists who thrived, excelled and mastered a subset of this world. Maybe they can relate to their childhood on some level, or marvel at their geniuses, or be amused at their misgivings. Biographies serve to bring inspiring lives, which probably started off as ordinary, but with a bit of genius coupled with large doses of determination, grit and persistence, these people made discoveries that changed the course of science and mathematics. Here we highlight three such great minds - Fibonacci who brought Arabic numerals to the western world, Einstein who questioned everything known about the universe and Marie Curie who sacrificed her life in pursuit of science. Pinecones, pineapples, cut lemons, sunflowers, nautilus shells - from miniscule creatures to mighty oceans to the depth of the ocean follow a blueprint. As they grow, they form in a mathematical pattern of 0,1,1,2,3,5,8,13,21...For instance, pinecones, as they form, fan out as 3, then 5, then 8 and so on. Nautilus shells spiral around squares formed by these numbers. Blockhead takes us through the life of Leonardo Fibonacci. Many of our young readers would relate to his early school years, when he would race through what was expected of him, and spend his spare time counting everything that could be counted. In the process he was lost to the world and earned himself his 'wanderer' nickname. Later, when he had the opportunity to travel the world, he taught himself fractions and geometry. Fascinated by the Hindu-Arabic numerals, he was convinced that they were a far more efficient way to keep count, in contrast with the tedious Roman numerals. He was dedicated to bringing the Hindu-Arabic system to the Western world, and wrote the Liber Abaci (Book of Abacus). 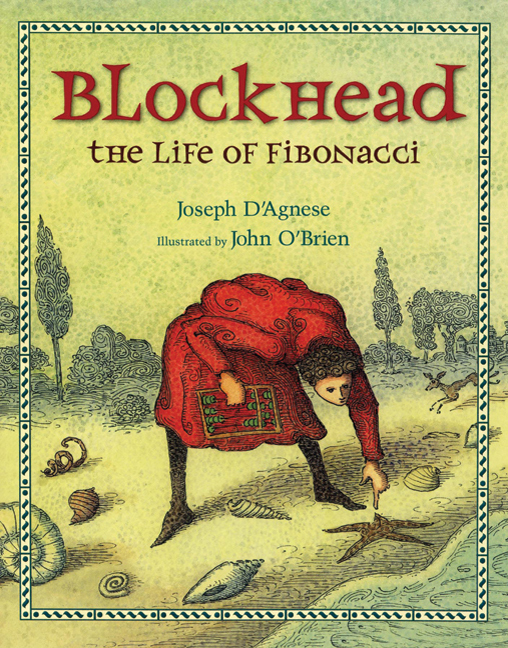 What I liked about the presentation of the biography was the pictorial format and simple writeups to expose little readers to mathematical sequences. Our favorite was the page with riddles and activities based on the Fibonacci sequence that has launched a journey of renewed observation and discovery of the world around us. In Odd Boy Out, we are introduced to a genius' life, brilliance made human by flaws. 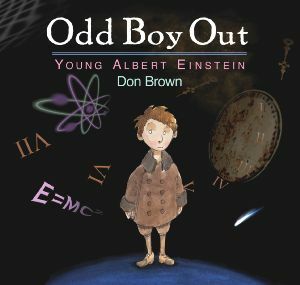 Young Einstein stood out among his peers, in the intensity of his emotional outbursts, he refused to participate in sports and was repelled by rote and drills at school. Ironically, he was not the snappy bright student giving lightning quick answers, instead, he took his time to reply which led to his teachers assuming he was a dull student. His brilliance though, shone with the help of a family friend Max. Max introduced Einstein to a world of wonder - where shapes, angles, lines take form and meaning. While other subjects remained unappealing, mathematics ruled his thoughts and he went on to translate his dreams into the discovery of an equation. This simple biography makes the life of a scientist who changed the course of our thoughts, more accessible and human. One illustration particularly stayed with me. We see Einstein as a new parent, pushing his baby stroller through a crowded park. While he is physically present, his mind is conjuring up equations to describe and quantify light. This is depicted in an impressive manner, on one page Einstein is walking among a throng of people, and in the next, he is all alone against a dark sky, lit up with nothing more than equations - people, things and other objects around him have no meaning or significance. Descriptive explanations such as this one, "Light is made up of tiny bits of energy called photons that behave like a spray of water from a hose" - are sure to leave a lasting imagery with young readers. This book offers an excellent, thorough look at the life of Marie Curie, first woman to graduate from France with a doctorate, first woman and first Polish Nobel prize winner. Coming from humble beginnings in Poland under a German rule, Marie worked her way against all odds and earned her admission into a university in France. By highlighting these struggles, McClafferty paints a picture of inspiration, the sheer grit and perseverance portrayed is suffice to encourage generations of young girls and boys. The story is told as is, the struggles and the achievements, with pictorial evidence, anecdotal details, photographs of snippets from her laboratory notebooks and personal quotations. Detailed descriptions of small and big moments in the non-academic life of Curie make the biography all the more personal. I particularly liked the pragmatic entry from Marie Curie's journal which records her first impression when she met her husband, Pierre. Likewise, her reaction to the news of his death is described with minute heart wrenching details. 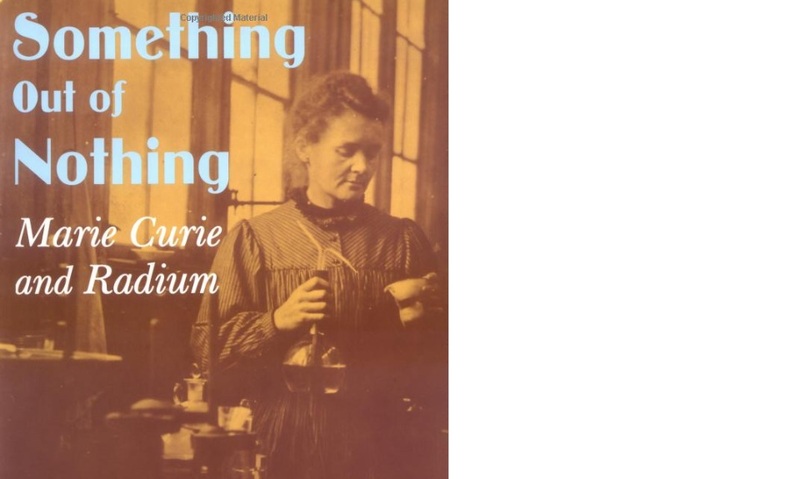 The book doesn't stop with the description of her scientific experiments, but extends to the effects of radium on the world - the dazzling and dangerous element, stealthily decomposing and causing harm, which was, unfortunately not known until much later. The significance of Marie Curie's discovery extends beyond radium. The wide applications of radioactive elements in today's medical community was all initiated by this one woman extraordinaire. Love all the picks Anusha and especially want to pick up Marie Curie book, for the kids. 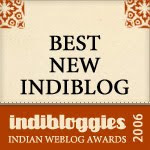 "Biographies serve to bring inspiring lives, which probably started off as ordinary, but with a bit of genius coupled with large doses of determination, grit and persistence, these people made discoveries that changed the course of science and mathematics"
Beautifully said, Anusha, and thanks for a wonderful collection here! Condensing an illustrious life to a few pictures and crisp words is not easy, especially if it is designed to inspire the young minds. Another picture book - Marie-Curie, Prize-Winning Scientist (Mortensen/Jaekel)- captured Madame Curie's life quite well.